Well, whoever wants to join can. I can manage quite a few people, and there is no shortage of parts. EDIT (11/8/12): What, did I scare everyone away? Long ago there was a village where resided a skilled craftsman. When the town came under the hold of a mechanik most foul, the craftsman gathered the town mages and they brought his statues to life and armed them. Catching the mechanik and his forces by surprise, they overwhelmed him and the day of the Golem became legend. Since then, the town has been renamed to Golemborough as it now produces works evolved from the work of the craftsman hero. In the back we first have the Golem Lord. Golem lords are made from stone like most golems but their fastenings are enchanted gold, giving them greater durability than normal militia golems. Lord Golems can command others of their kind, wield mighty maces, and have a small amount of magical ability. Think of them as officers in tanks. Next in the back are the militia. They come in Swordsman, Lancer, and Axeman variants with helmets to match. Made using steel fastenings and stone, these golems make the bulk of the Golemborough force. Heavy infantry role. The brown golem is made from wood enchanted to hold it's life energy and absorb the warmth of the sun. This these golems need no bottled magic to power them. These golems act as clerics and mages for their crafted fellows and can replace a Golemancer if need be. They lack the skill that human Golemancers have but are more durable than them to compensate. In the front row we have the Golemborough guard, who wear their armor, wield spectacular blades, and defend Golemancers. After the guard is our hero, Lance "Ironskull". Ironskull had been captured by a Mechanix force as a boy and forced to undergo experiments to make him faster and stronger. He was rescued before being turned into a complete machine but a part of his brain is clockwork, now enhanced by magik. Ironskull also wields the sword known as "Chill's tear", so named after the tearful story of it's origin. Hero unit. Golemancers wield staves and carry hybrid shield blades to better defend themselves. Golemancers are skilled casters who specialize in enhancing, repairing, and creating golems. Although not as durable as mage golems, They have greater skill with magic. Caster/ "summoner"
Next is the siege golem. Siege golems are made from harder stone and are fortified with black steel, a magically enhanced metal. They use great shields and are used to defeat great enemies with the use of golem crossbows, maces based on Lord Golem weapons, and the burst lance (A magic device that not only can pierce a target with it's magic tip but release a burst of magic as well). It's a tank for tanks/ the artillery. Finally, we have the Crystal Golem. Enchanting Crystal for golem use is very difficult and can go horribly wrong (thus exploding into a thousand diamond sharp shards) if done wrong. But when golemancers do manage to create Crystal golems... impossible battles are won. Crystal golems are conduits of magic due to their composition and act as spellswords. In addition they move faster and are surrounded by a magic aura that shields them. This aura can be broken however, exposing delicate crystal that is easier to shatter than stone or wood. Crystal golems are an "almost heroic" unit that I would compare to starcraft archons. That's great, Tankaris! I'll add you to my list of participating people. If the squad system is no longer going to happen is there anything I need to change or is the 8 unit-type limit still in? The 8 unit limit is still in place, you just don't have to put all your units on a specifically sized baseplate. So am I still in this, and do I need an eighth unit? Well, you need to tell me some backstory on your units before I officially add you to the battle. Once you do that, you're in! Anything we need to do to prep up for the upcoming epicness? 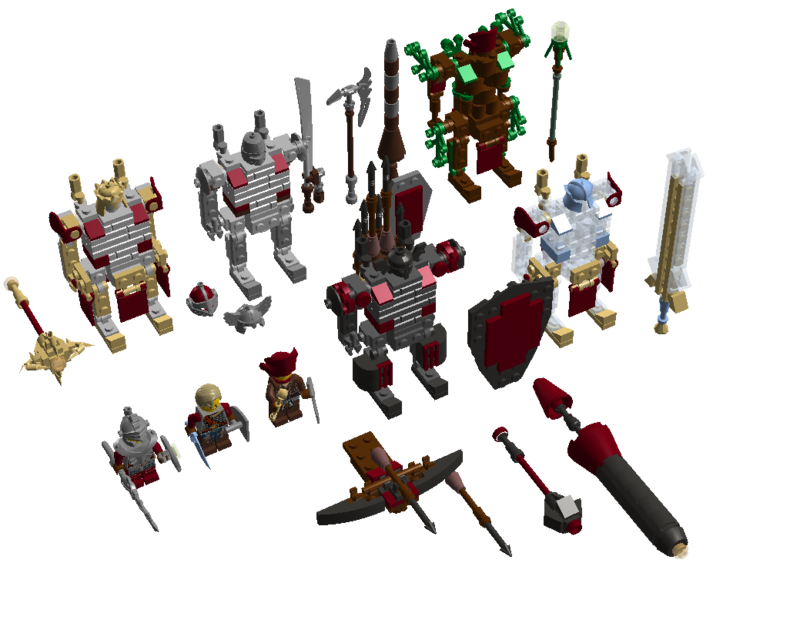 All you have to do is send me a link to the .ldd file that contains your army, so I can splice it into maps. You can put it here, PM it to me, or I will send you my personal email and you can send it there. Would I be too late to join the party and make a Mechanix group? Last edited by dilanski on Tue Nov 20, 2012 6:15 pm, edited 1 time in total. "Tempered by the burning Forge, wrought by the hands of fate"
The Nation of Forgewrat'th was formed in time immemorial, before the war between Magix & Mechanix, once no more than nomadic tribes quarrelling over the precious little water and food of the volcanic plains, these groups set aside differences and past trespasses and were united as one by the discovery of the forge, a discovery which sparked possibly the first industrial revolution. 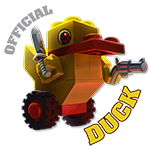 Since then there factories have produced some of the finest machinery in the dominion of mechanix. It is said the great city of Dreadsmoke, built atop a volcano which powers its forges, could produce the tools and equipment of an entire army in a single day, and its ship yards produce the most majestic warships in the realm, the site of the fleet docked out of harbour on the lava lake of Decragma would bring an invading army to its knees, and if not the sight then the cannons certainly would. In recent years however the fire that burnt brightly in the peoples spirit has turned to mere embers. A great defeat was taken at the court of Runescevi, as the magix turned the court and surrounding city into dust. hatred keeps there forges burning, and hatred will re-light there spirits. Forgeborn: from a young age children of Decragma are taught the noble profession of blacksmithing, how the hours of work and sweat lead to great returns, so many go on to work the forge for the rest of there life, leading to a population burly men. When the call goes out to raise a legion to fight the magix, blacksmiths fill the ranks quickly. to quickly facilitate the formation of a fighting force men are told to craft whatever armour they need and bring there hammers to use as there weapon. The 'Forgeborn' are as blunt trauma as there weapons, with dozens of men piling on top of magical constructs ripping them asunder. Knights of the Forge: Conscripted men who fight for patriotism and plunder, they have the best hammers and armour crafted and can often be seen riding into battle on horseback. Many of them will spend time training before going into combat and tend to fare better because of it. Firesprites: Skilled archers are in high demand to fill a regions ranks, and the 'firesprites' are some of the best. Striding into battle atop specialised stilts there ally is mobility, as fast as horses and nimble as gazelle they often serve as forward scouts, tracking enemy positions while safe from most spells and weapons. Raiding is another tactic used by firesprite squads, moving swiftly under the cloak of darkness into enemy camps. War Obelisk: Some of the most revered war-machines Forgewrat'th has to offer, a Primordial AI fused with a specimens brain controlling a large hulk of armour and weaponry. The smallest are roughly 10 metres tall and capable of carrying a group archers on there into battle, while much larger versions, almost as large as warships do exist, with full bunkers and command posts mounted on there backs. Commandant Kit Ironcrotck: An accomplished warrior with many years of service, he was present at the counter offensive on the Court of Runescevi, pushing back the magix invaders. His weapon, the Hammer of Dusk was hand crafted by himself it contains the night stone, an enchanted crystal and spoil of war, with the ability to control day and night. 'Ignisclast' is one of the most well known War Obelisks, while its size and armament are a notch below the largest Obelisks, It's story is near legend. the forces magik were surrounding the city of Combrin, local guards were out numbered 5 to 1 and troops wouldn't arrive on time to stop the attack, the mechanix of the city came together to find a way to defend the city, they worked tirelessly, for 2 days, and on the dawn of the magix attack, they were met with Ignisclast, as troops arrived 6 hours from the attack starting expecting to find rubble, Ignisclast was still fighting, it had lost an arm and was limping, with a 4 meter long enchanted arrow sticking out its left knee, but was still holding back wave after wave of magix. After the battle the machine was repaired and augmented, with twin Magna Cannons, one of the most potent weapons constructed. Last edited by dilanski on Wed Nov 21, 2012 5:12 pm, edited 3 times in total.